Let me start by saying that I haven’t always made the “greenest” of choices, and that I am still not an environmental nut. I still make very selfish choices for very selfish reasons, and my journey to a green, chemical free lifestyle was started by a complete accident. It all started with a steam mop. When my oldest was just a baby, I was very isolated. I lived a thousand miles away from home, and didn’t have a lot of friends, so I joined an online moms group. These moms shared EVERYTHING about their lives and it made me feel better to see that a lot of them were going through the same things as me, or sometimes a lot worse. On one particular day, there was a post with a lot of pictures asking for help identifying what was going on with a particular mom’s daughter. She had a lot of open wounds and rashes that had started popping up on the bottoms of her feet, legs, arms, and palms of her hands. I wanted to cry looking at these pictures, and none of us had a clue what was causing it. The mom made an appointment with her pediatrician who was also clueless, but said that it looked like a chemical burn of some sort, but could also be an allergy. He referred her to an allergist, but in the meantime, this poor baby got worse. They went to an allergist who finally identified that it must be an extreme allergy to the products that this mom was using to clean her floors (beautiful hard wood or laminate floors throughout her house, by the way). This was nearly 10 years ago, and green wasn’t as “in” as it is now. This mom, other moms in the group, and myself all researched and found different ways to clean, chemical free. All I could think at the time was that my baby was only weeks away from crawling around his own self, and I wanted to make sure that nothing so horrible could ever happen to him, so I tried everything that I found as well. I want to go a step further and say that I have NEVER been a person that keeps the cleanest house. I sweep, vacuum, and mop because I have to, but I tend to skip the chore whenever I can because I HATE it with a passion… So when it came to all the remedies I found with vinegar, lemons, and baking soda, I tried them, but didn’t really care for them because they were time consuming (and dealing with mop water and a nasty mop is just gross). Once night when I was up feeding my little bambino, I turned on the tv, and there was an infomercial for the Shark Steam Mop. This was it. It was the answer to my lazy and chemical free prayers. It cleans with just water, no chemicals, no lemon, no baking soda, and no vinegar… It cleans with the power of STEAM (which is soooo cool to watch, by the way)! No more buckets, just a pad (that, honestly, is completely filthy by the time I’m done mopping the floor of one room of my house) that can be thrown in the washer when you’re done. I bought this beauty that night, got it within a week, and went crazy cleaning my house with it. My little one was crawling around before I knew it, and I had peace of mind, because NO ONE is allergic to WATER. I shared my testimonial on that mom group, and they all bought one too. 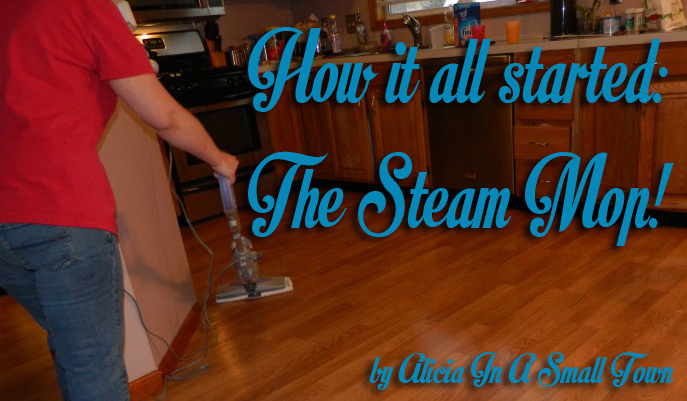 We all fell in love with our steam mops! Now, I’ve had a few steam mops in the last 10 years. They don’t last forever, but they do go through a beating. My kids love to use my steam mop (the only chore I can get them to do without complaint), and they aren’t quite as gentle with it as I am. The steam mop I started out with cost about $50, and when you compare that to the cost of a bucket, mop, and nasty chemical cleaners that you have to continue to purchase, the $50 is well worth it. When we move, I plan to upgrade to a slightly better steam mop (since I’ll be able to use it over every surface of the new house, instead of in just a few rooms), but you could never convince to not have a steam mop in my arsenal of cleaning equipment! Do You REALLY Put Your Smartphone To Use? Sounds like a good investment. We just moved into a new place with all wood floors and they’re a pain to keep clean with dogs. Love my steam mop! I do not have children yet but when I put in my new floors I wanted to make sure I was not adding a layer of chemicals to my floors and use my steam mop to do so! I also love my Norwex products that allow me to clean with just hot water! I have a steamer too and I use it for bathrooms and kitchen. It does a great job and I do not use chemicals with it. The house actually smells cleaner after I use it. Chemicals are bad not only for kids, but for us also. It is amazing how many people have all kind of allergies to everything. Great post! I HATE cleaning too! I might need this!